Emerald Ash Borer (EAB) was confirmed to be affecting trees in Minnesota several years ago, and thousands of ash trees around the Twin Cities have had to be removed because of this infestation. The University of Minnesota Extention's web site has a wealth of information about the Emerald Ash Borer, including ways to help identify if your ash tree has been infested with the Emerald Ash Borer - http://www.extension.umn.edu/garden/insects/find/emerald-ash-borer/. The primary thing to keep in mind with the Emerald Ash Borer is that ash trees do not have a way to defend themselves against the Emerald Ash Borer, and these trees will die if they they become infested, unless they are aggressively treated with insecticides. Pioneer Tree Service is currently providing ash tree injection for EAB (see photo below). 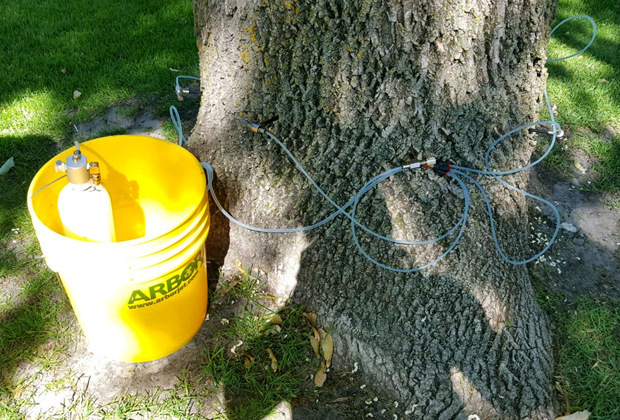 Call 763-238-5254 today to setup an appointment if you suspect your ash tree or trees are being affected by Emerald Ash Borer, or fill out the Request Free Estimate form on this page.